Play Rings of Fortune online for free now! In Rings of Fortune you are entrusted by the wise Wizard from a magical land with the task of finding a ring which will decide the fate of the land and holds the secret to a fabled treasure. Embark on a journey through dark forests, meet the elf residents and discover the golden gem: Its inscription reveals the hiding place of the riches that you can claim with the help of the Wizard - and a little luck! 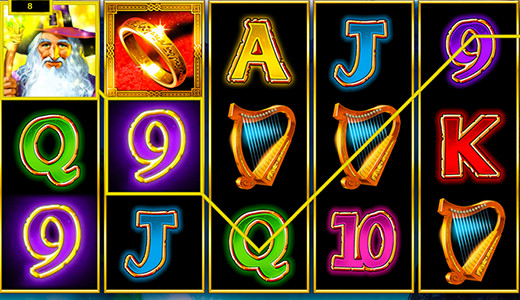 The aim of the adventure in Rings of Fortune is to earn 5 matching symbols along up to 10 win lines. All winning patterns start on the first reel on the left and run along the win lines to the right. In order to win, the winning symbols cannot be interrupted by any other symbols between them. At least 3 Rings (Scatter symbols) trigger 15 win games with jackpot option; their position on the reels is irrelevant. The Wizard (wild symbol) acts as a substitute for all symbols in the game except the Scatter and lands you the big jackpot when it falls 5 times during the free games! Collect the mysterious Gold Ring and gain access to free games with a jackpot! 3, 4 or 5 Rings (Scatter symbol) trigger 15 free spins with the settings of your last regular game. If you land Wizards during the free games, they are fixed and fill all of the positions on the affected reel. Wizards symbols can act as a substitute for all symbols except for the Scatter. You can win additional free spins when a further 3, 4 or 5 Rings appear during the free spin rounds. 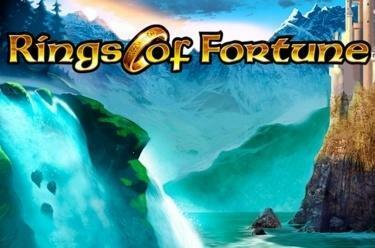 Rings of Fortune has a common progressive jackpot for all stakes and currencies. Should you land 5 Wizard symbols in the free spin rounds, you win the jackpot. With the maximum bet you get 100%, when betting less you get a share of the jackpot corresponding to your bet.